A common problem seen in chiropractic practice is pain, numbness, and/or weakness associated with a herniated disc. Though less commonly a cause of back or neck pain, herniated discs are among the most common causes of symptoms in the upper and lower extremities. The spine starts at the base of the skull and extends downward ending at the tailbone. It is comprised of 24 individual bones, called vertebrae. Each vertebra is separated from the ones above and below it by shock-absorbing structures called an intervertebral discs, or simply discs. Discs are made up of a tough, fibrous, outer shell (called the annulus) and a soft pulpy inner material (called the nucleus). In its normal, healthy state, the nucleus resides within the annulus like jelly inside of a doughnut. The discs help to absorb the shocks of jumping and running as well as the sustained weight-bearing loads born by the spine as a result of gravity. Approximately two thirds of our weight is supported by the discs, while one third is supported by the joints of the spine which sit behind the discs. Without the discs, all the weight of our bodies and the shock forces we experience during activities would be born by the joints of the spine alone, causing them to wear down quite quickly. Herniated discs are very common findings seen on MRI or CT imaging. Herniated discs cannot be seen on X-rays. Herniation describes the abnormal protrusion of body material from an enclosed cavity. In the case of a disc herniation, the nucleus protrudes through the annulus, like jelly squeezing out of a doughnut. Weakened muscles of the ‘core’ in the lower back, abdomen, and buttocks lead to excessive weight bearing by the spine. This in turn places extra strain on the shock and weight absorbing discs. These excessive forces lead gradually over time to small tears in the tough, fibrous annulus. As these tears take place over time the areas containing tiny tears become structurally weakened, often leading to larger tears and extension of the damaged area to create a visible rent or defect in the annulus. When the tears are large enough, the gelatinous nuclear material migrates outward from the center to fill the rent, causing the disc to bulge. Disc bulges get bigger as the tearing continues over time until finally, the annulus tears open completely (ruptures), creating an opening large enough to allow some of the nuclear material to protrude from the disc out into what is called the spinal canal and/or the lateral recesses. At this point, we refer to the process as a disc protrusion or a herniated disc. Perhaps the most important thing to understand right from the start is that annular tearing, disc bulges, and even disc protrusions/herniations are not necessarily painful events. Discs themselves have generally poor nerve supply and in many patients disc injuries are not associated with any pain. 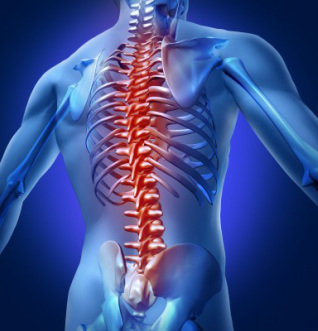 It is rare that chronic back or neck pain comes from a herniated disc. That is not to say that disc herniations cannot cause pain into an extremity (arm or leg), or that the swelling and inflammation associated with large, sudden disc herniations cannot cause acute pain in the back or neck. But approximately 50% of all adults who have never experienced significant pain in the neck or back have disc herniations on MRI evaluation. This means that somewhere along the way, the progression of tearing, bulging and ultimately herniation took place with no symptoms whatsoever. So common is the finding of a herniated disc, that clinicians skilled in treating neck and back pain must have much more evidence than simply the finding of a disc protrusion on a CT or MRI scan before making a diagnosis. A finding is something that is abnormal on an examination. A diagnosis is a disease or disorder. When a finding is the cause of a condition, it is sometimes used as a diagnosis. However, in the case of disc herniation, the finding is often not the cause of the problem. If your condition has been attributed to a herniated, degenerated, or bulging disc, you should be sure that your clinician has been careful to match your findings to your symptoms and to rule out all the other more common causes for your problem. If disc herniations don’t cause pain, why do people get treatment for them? Nerves which emerge from the neck run down the arms to the hands and fingers; nerves which emerge from the lower back run down the legs to the feet and toes. Each nerve carries electrical impulses down to stimulate muscles to contract, and also carries impulses back from the skin and body tissues which is how we perceive sensation. Each different nerve supplies its own specific set of muscles and its own specific patch of skin, and these are quite consistent from person to person. For example, radiculopathy of the C-6 nerve, caused by a herniated disc at C5/6, can cause pain and/or numbness and/or tingling in the upper back, shoulder, arm, hand, thumb and first finger; it can also cause weakness in the muscles which bend the elbow (biceps) and pull the wrist backward (wrist extensors). On the other hand, a herniated disc at C5/6, in which the extruded nuclear material does not compress or irritate a nerve may very likely cause no symptoms whatsoever, and most people have experienced at least one such disc herniation somewhere in their spine over the course of their lifetime without knowing it. Surgery or conservative management, which is better? I tried physical therapy/chiropractic and it didn’t help. Should I see a surgeon? No two doctors or therapists are the same, but there is more variation between chiropractic doctors than in any other specialty. Part of the reason is because not all chiropractors receive the same training. Most chiropractors in the United States focus primarily or exclusively on spinal manipulation as their mode of therapy for any and all cases they see. Regardless of medical diagnosis, these chiropractors limit their attention to what they term subluxations or ‘spinal misalignments’ which they believe to be the cause of virtually all problems. Physical therapists, by contrast, are not trained in and are not legally permitted to perform spinal manipulation treatments. For most physical therapists, patient assessment is approached from the standpoint of strength, flexibility, and postural evaluation. Pain, they believe, is the result of weakness, lack of mobility, and poor posture. Exercises and stretches to improve strength, posture, and mobility are the primary or exclusive therapeutic modalities. While good posture and improved strength and mobility are good things, they will not bring about the resolution of many physical ailments including pinched nerves caused by herniated discs. Nor will spinal manipulation by itself permanently re-align the spine to decompress a pinched nerve. Proper conservative care must include strengthening, nerve stretching, traction, manipulation, and management of inflammation. Each part of the treatment addresses a different but essential component of the problem. If you have had P.T. or chiropractic treatment but have not been given core strengthening exercises which dramatically push you to improve strength in the lower back, buttocks, and abdomen, or have not been given nerve stretches to be done regularly throughout the day, or have not undergone traction treatments, decompression exercises, or anti-inflammation therapy, then you have not yet undergone a comprehensive course of conservative management and should not seek surgery yet. On the other hand, if you have undergone comprehensive conservative management for up to 8 weeks without significant improvement in your symptoms (at least 75% recovery), it is time, in my opinion, to seek a surgical consultation.